This is an old favorite of mine. 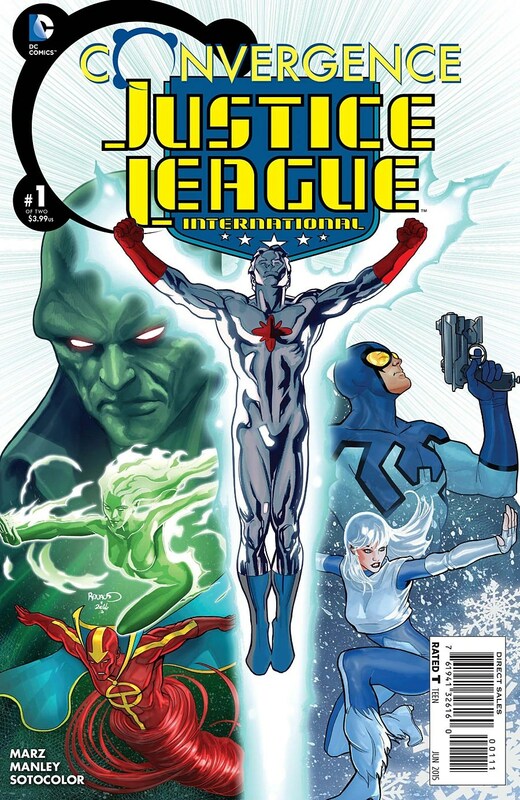 In this episode of Batman: The Brave and the Bold, Captain Atom has lost his powers. 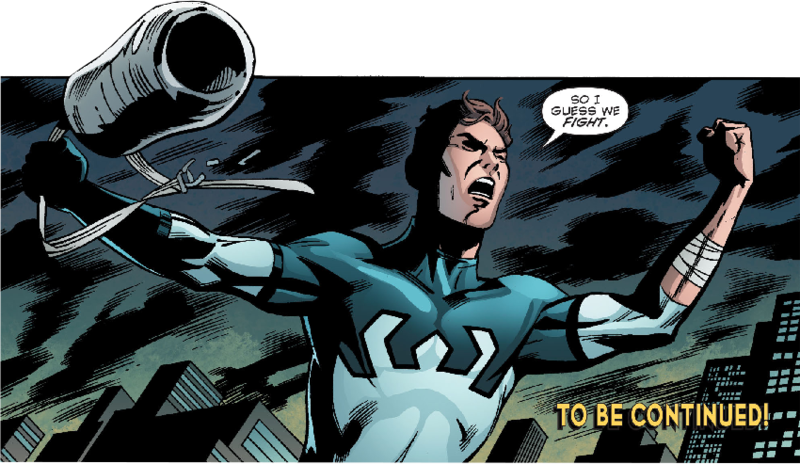 He dons a new costume (reminiscent of his Silver Age costume) and attempts to fight crime with no powers. 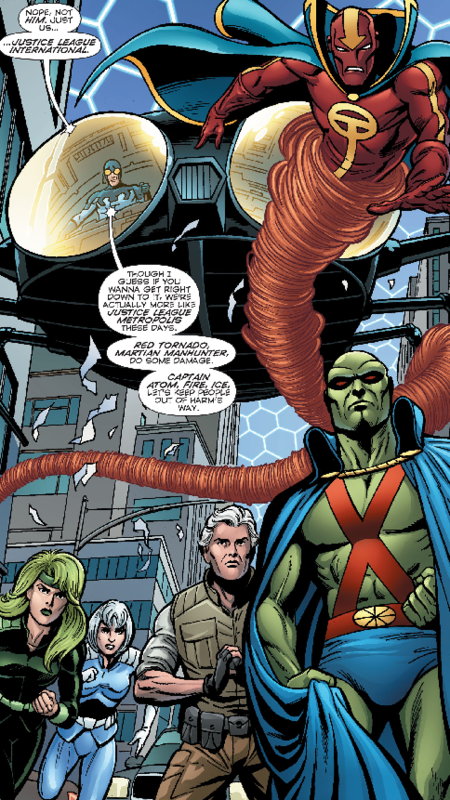 When he feels he’s useless at it, Aquaman gives him a pep talk in the form of a song. This episode (Season 3, Episode 10: “Powerless!”) aired October 21, 2011 on the Cartoon Network. 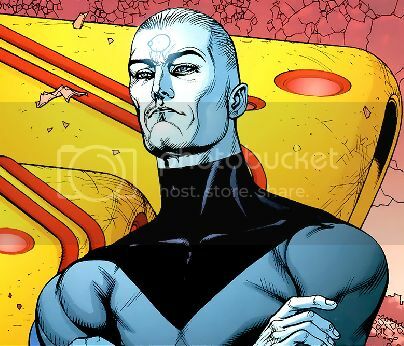 Aquaman was voiced by John DiMaggio and Captain Atom was voiced by Brian Bloom. Captain Adam and Gunner are at an exhibit of Air Force technology. Also in attendance is Professor Koste, a man that Adam had dismissed as a security risk. Koste uses what looks like a red iPhone to summon a bunch of green-clad thugs, who come crashing into the exhibit. 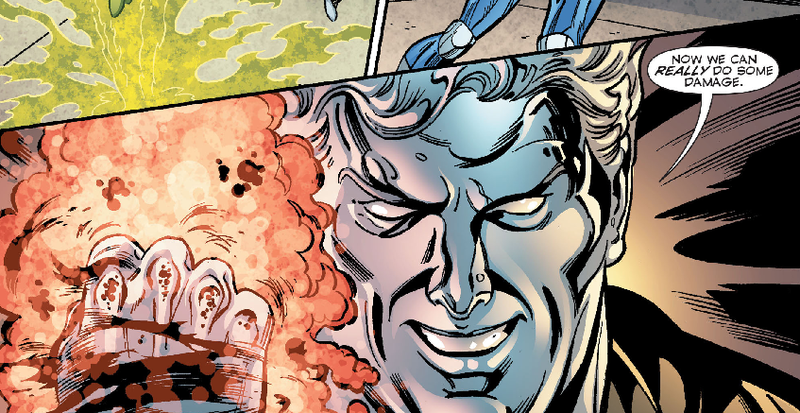 Before they have a chance to cause any real trouble, Captain Atom appears to put a stop to their shenanigans. 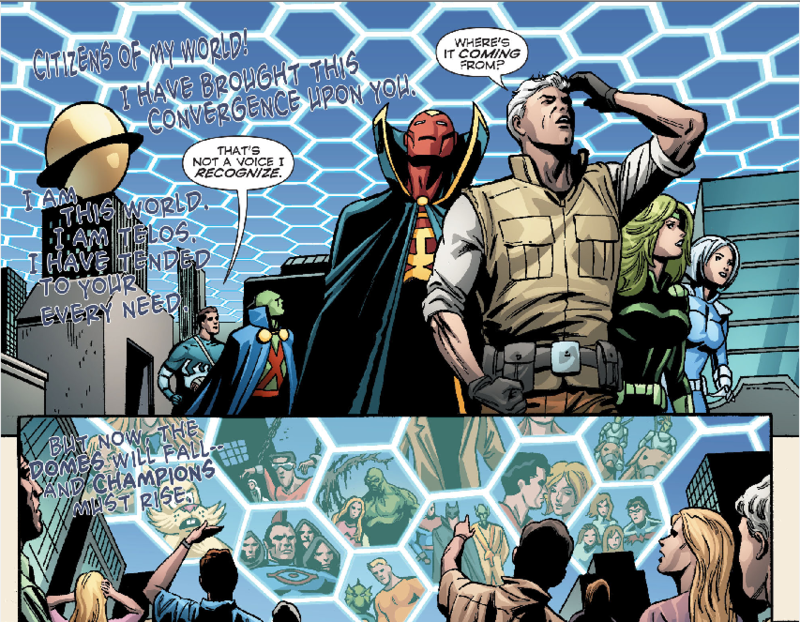 The civilians watching the fight recognize Captain Atom. 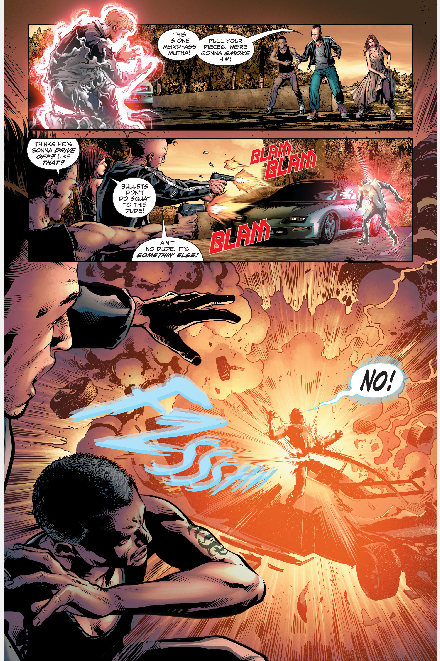 He rescues a group of them when one of the thugs shoots down a rocket display. 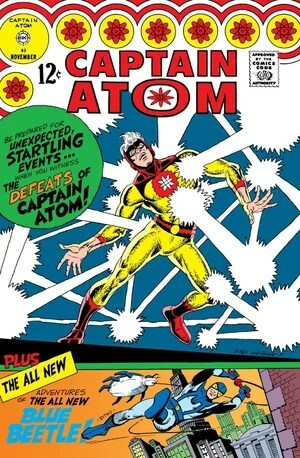 The thugs run off and Captain Atom realizes he has a rip in his costume. He has Gunner move the adoring crowd away. They notice he is glowing. 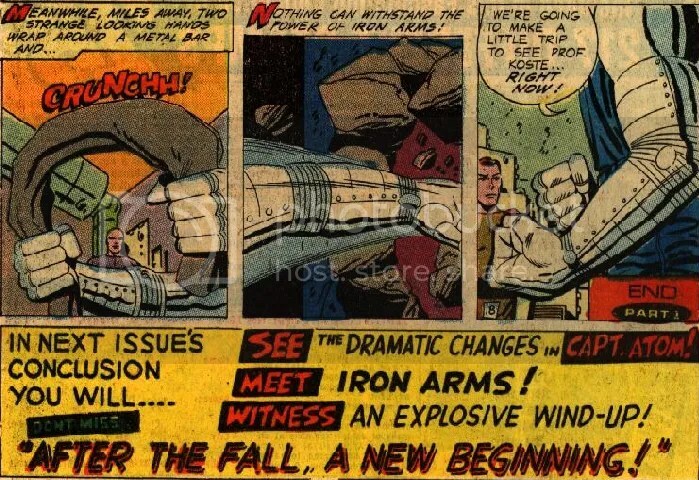 One particularly forward-thinking reporter snaps a picture of Cap’s glowing armpit. Meanwhile, Professor Koste takes advantage of the distraction to steal some equipment. 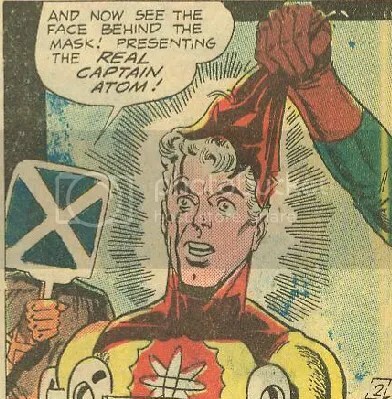 Captain Atom flies back to the base to get a spare uniform (maybe the blue one from Space Adventures #33). 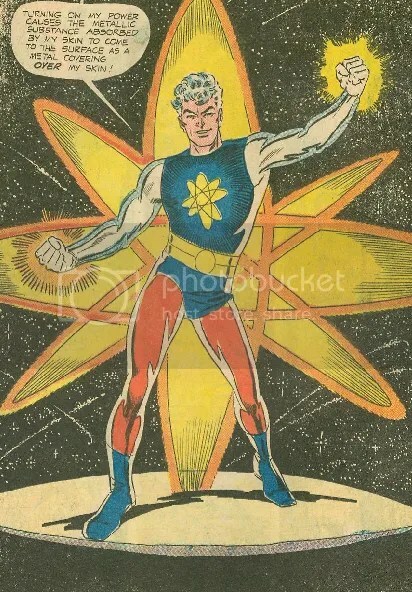 His costume is blue in the story that makes the papers immediately; headlines read, “HERO IS RADIOACTIVE MENACE: Air Force Super-Hero is a Threat to the Public.” Word spreads fast and soon Captain Atom is taking a call from the president (Lyndon Johnson). He’s concerned about the Air Force’s public image. Oh, and the spare uniform is yellow. 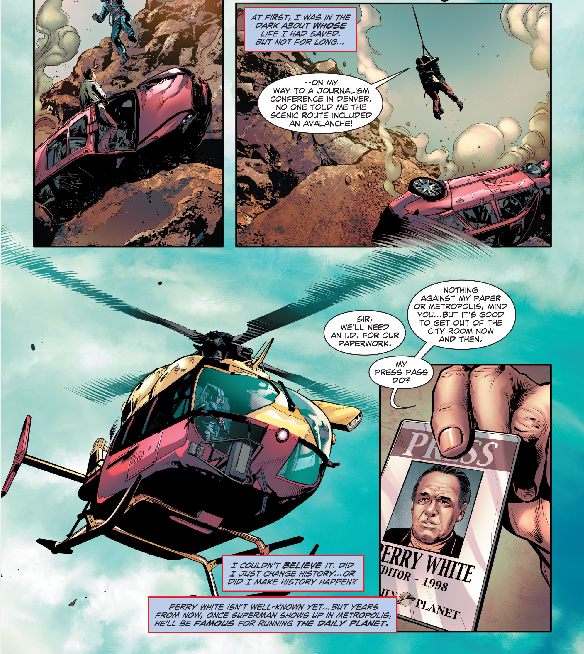 Captain Atom flies off to meet with Professor Max Lipat, an old co-worker of Koste’s. Just getting to the reactor weakens Cap. When he arrives, he attempts to absorb the excess radiation and convert it into a harmless state. 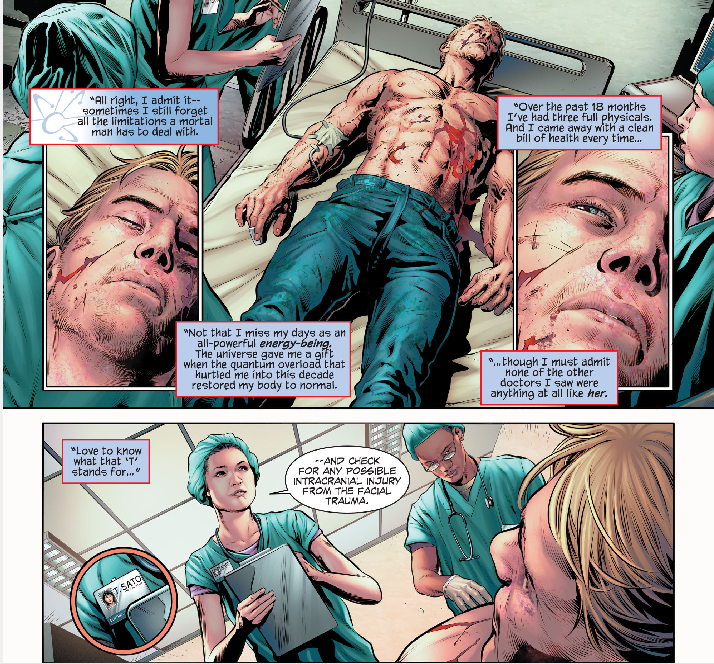 Cap pushes his body to the limit trying to convert the radiation. He passes out just as the reactor shuts down. Koste calls his men to the base. 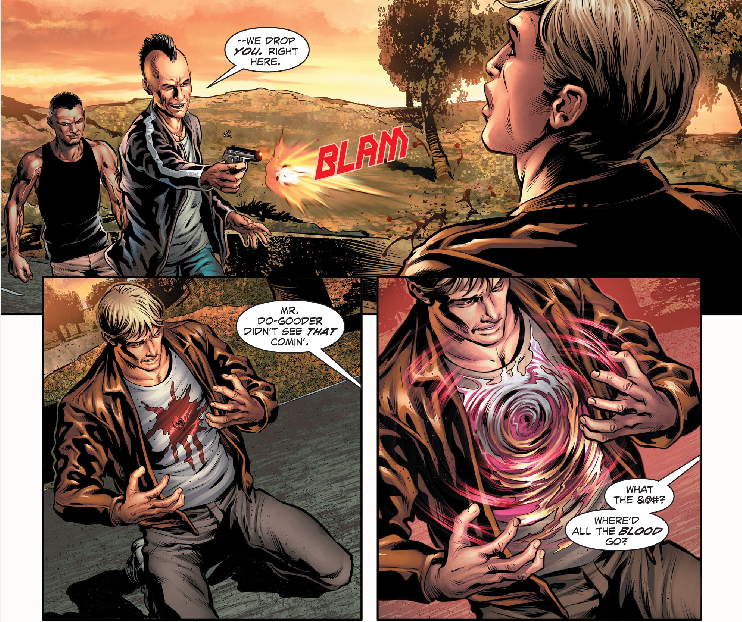 When Cap awakens and finds Koste and his men on the base, he springs to action. 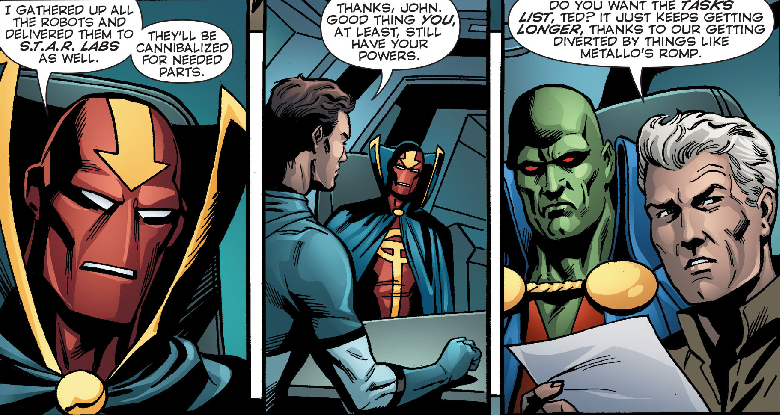 He finds his powers have diminished. He can’t pass through a wall. 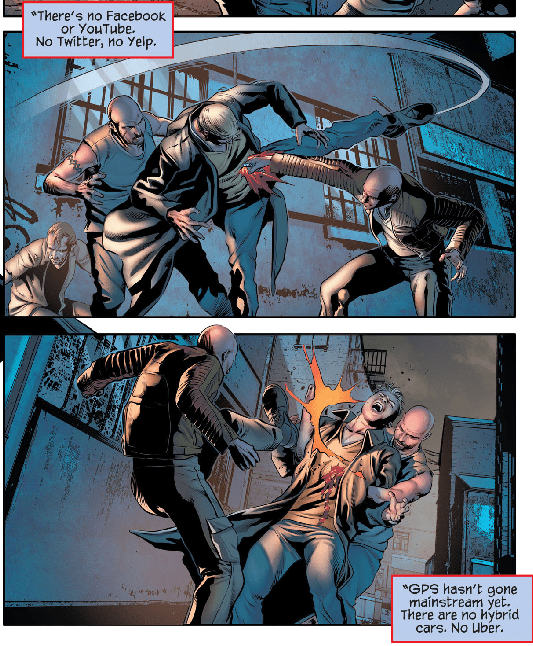 He barely manages to pull himself out of a wall when he is set upon by a group of Koste’s men. 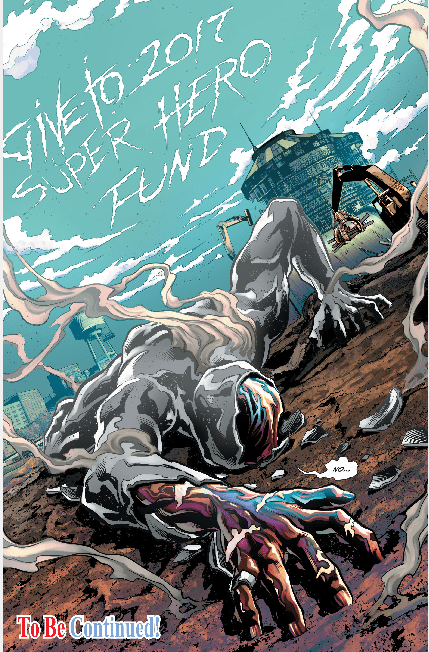 Even without his super-strength, he manages to hold his own – at first. 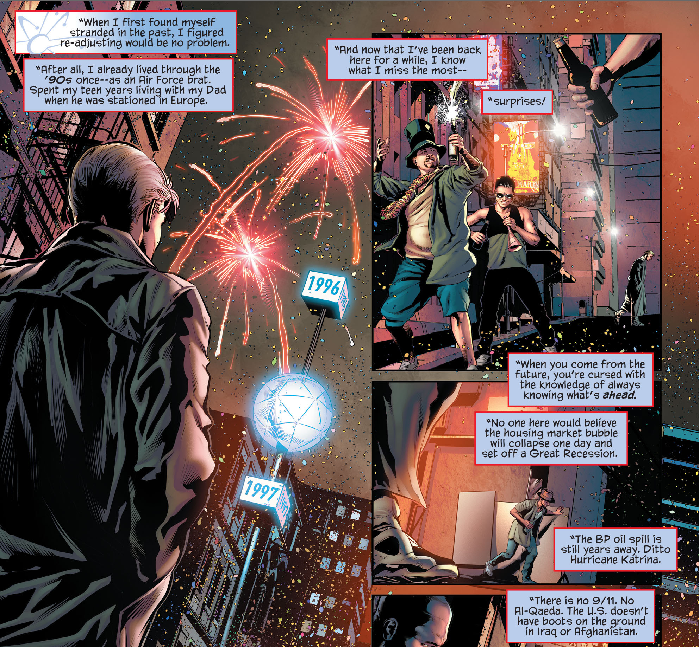 The bad guys have numbers on their side and they knock Cap out cold. 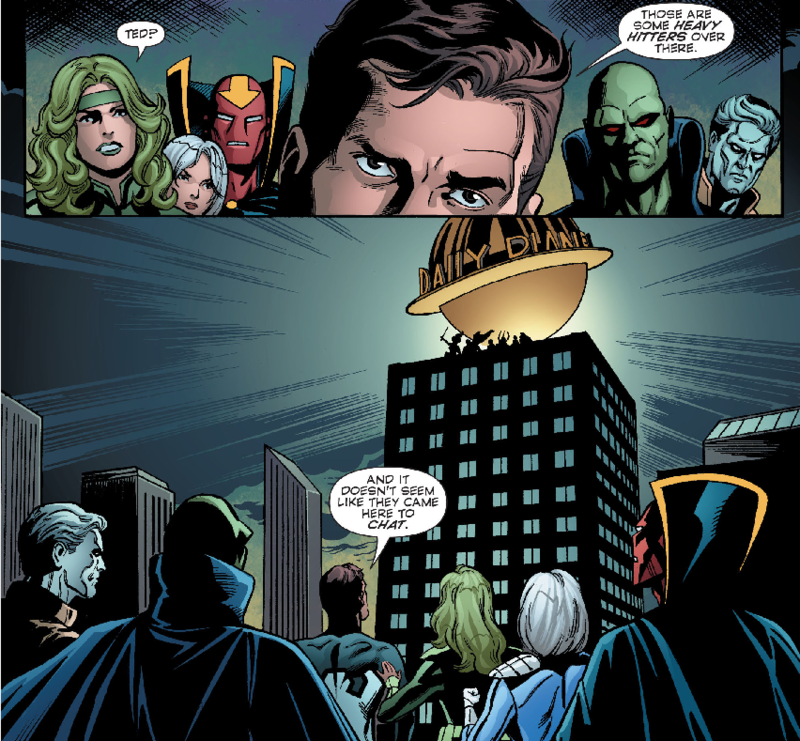 Koste orders them to take Cap to his hovercraft. 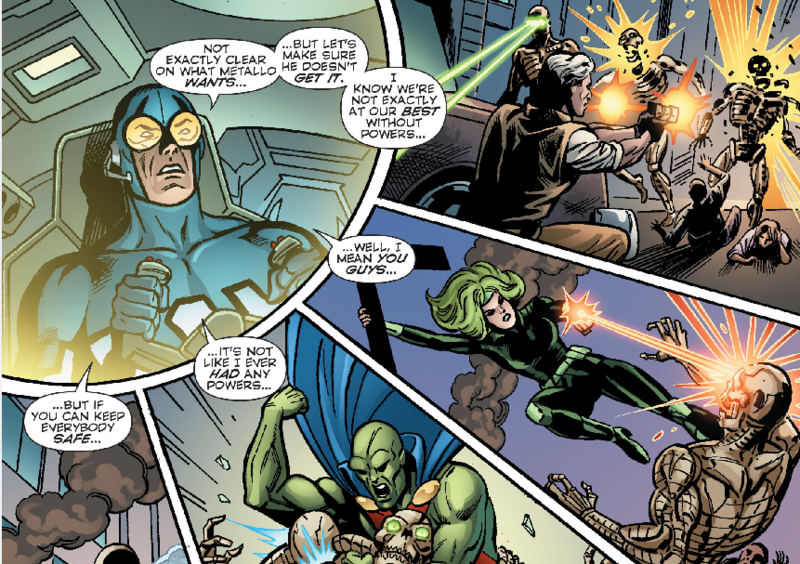 Meanwhile, miles away, a strange man with metal arms is demonstrating his power and vowing to make a trip to visit Koste. 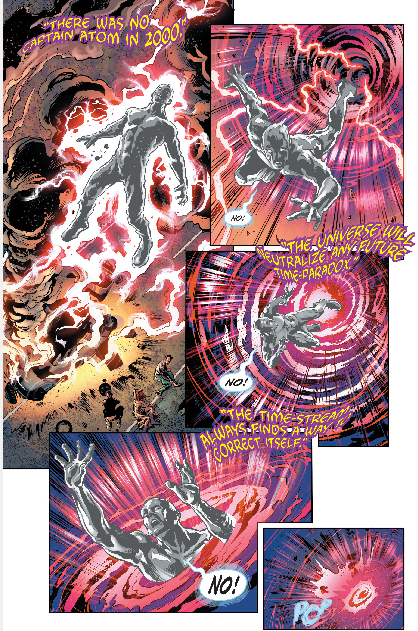 So, Captain Atom is finally defeated. 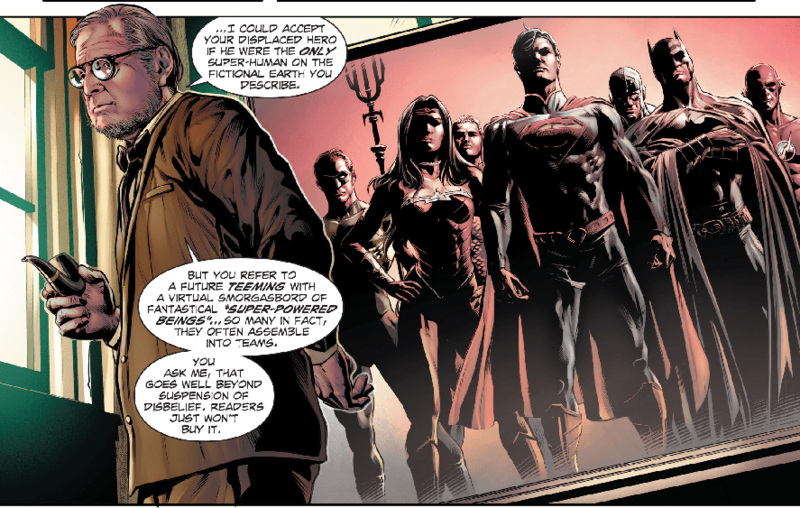 And a new villain (or hero) is on the horizon. 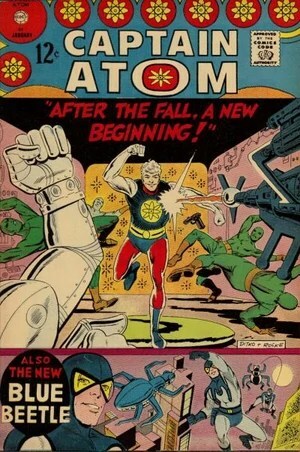 This is the first time a Captain Atom story was “to be continued.” It didn’t really have to be, though. Not a lot happened in this issue. 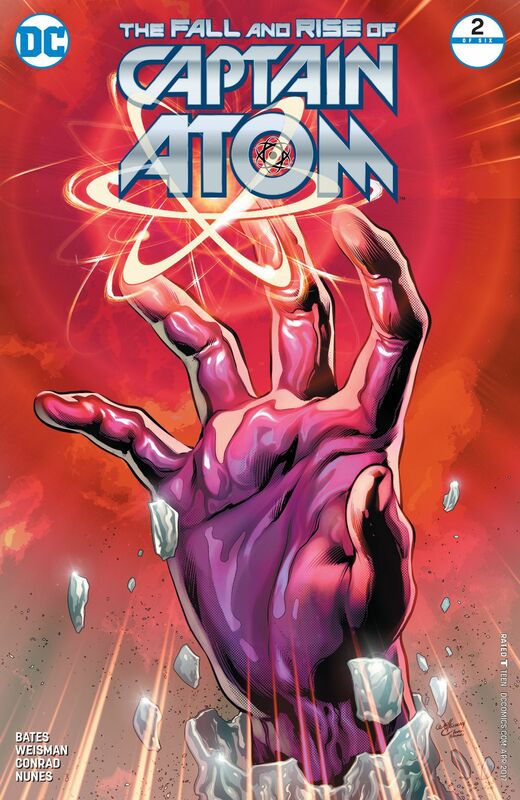 The big changes happen in Captain Atom #84. I give this one a C+. It is all just setting up the next issue. 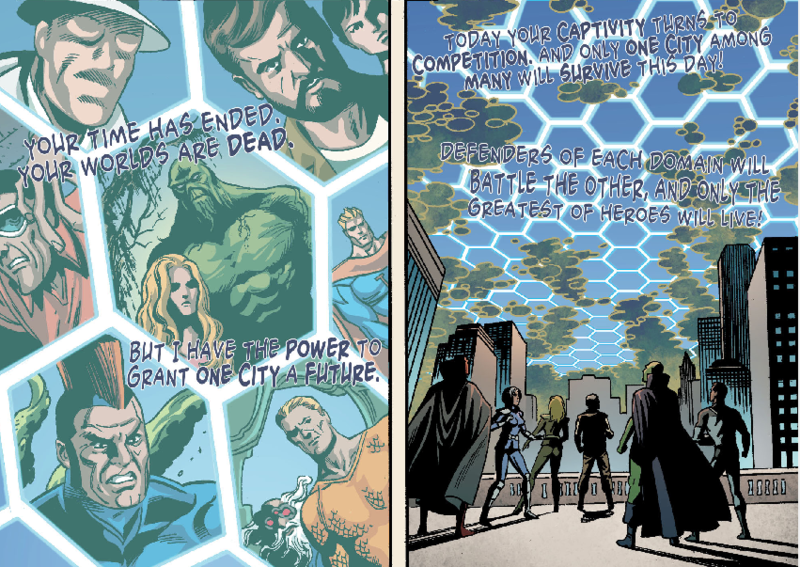 The big deal with this issue is the back-up story, Steve Ditko and Gary Friedrich’s re-imagining of the Blue Beetle. 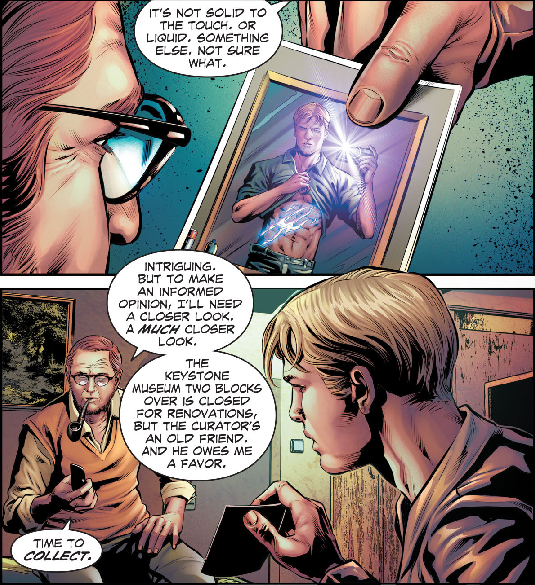 This is the first appearance of the Ted Kord Blue Beetle, later a property of DC Comics (just like Captain Atom and Nightshade). 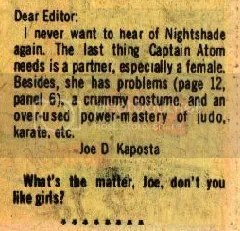 Also this is the first issue of Captain Atom to feature fan letters. 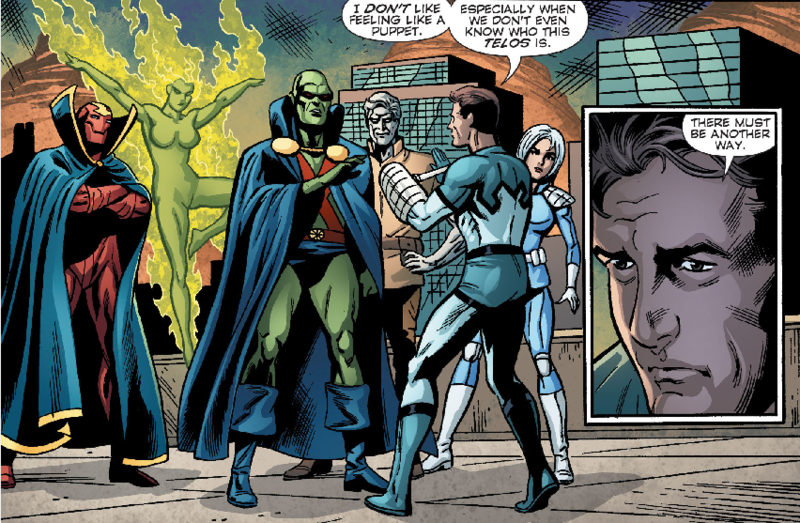 Most of them applauded Captain Atom #82 and Nightshade, but not everyone was happy. To the right is evidence of the early stages in the evolution of The Internet Troll.